Location Location Location!!! True ski in ski out!! No Walking to Slopes!! No numerous ice covered Stairs to Climb!! The Best Cabin you'll find here at this altitude!! *No cabin sharing with non-slope side cabin guests is permitted, Strictly Enforced. 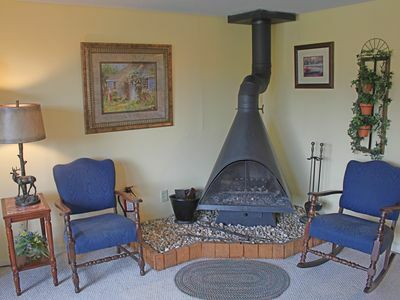 Enjoy a very cozy TRUE Ski in Ski out Slope Side cabin located over a mile high. Several owners “claim” to be ski in ski out but for some reason you have to walk to the slope! 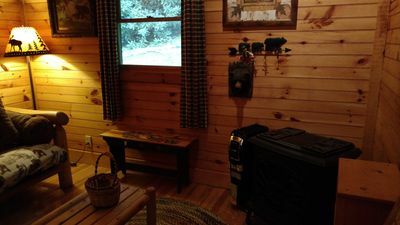 This cabin is right on Shawneehaw Slope, locally owned and operated with the cabin owner right next door for your convenience, advice, and peace of mind. No rental agent that you can't contact or homeowners located hours away from your needs. The means the cabin is continuously maintained for ease of access, with cleanliness and guest safety a priority. On your arrival no numerous stairs to climb and pack all your equipment, food, and coolers up and down. 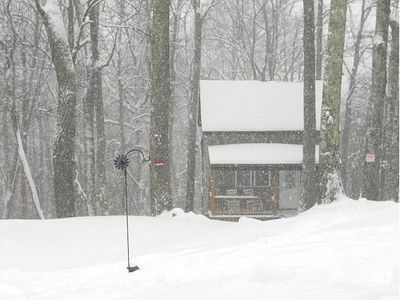 Just back your vehicle up to the cabin, unload, and hit the slopes!! 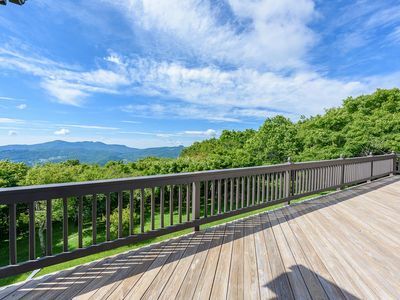 In the morning drink your favorite coffee while enjoying an amazing sunrise and breath taking views of Grandfather Mountain. 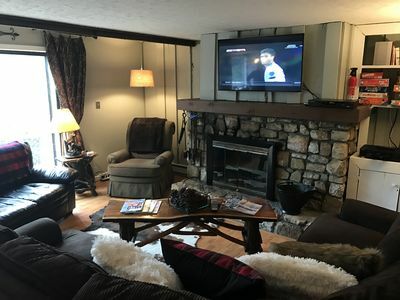 With wrap around windows you can enjoy watching skiing and boarding from the comfort of a custom wrap around dining table staying warm by a remote thermostat gas fireplace. 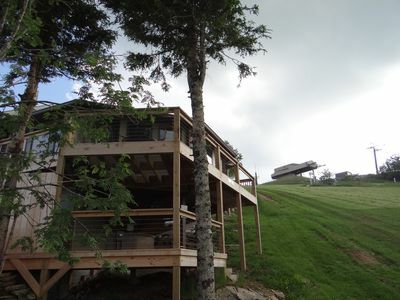 You may want to experience the same slope side view outside from the wrap around deck just a few feet above the slope. It's so close you can talk to boarders and skiers right from the deck. 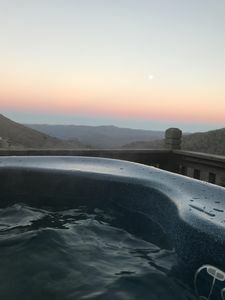 You're also just a few yards from the top of the resort where the famous 5506' Skybar is located serving our very own Beech Mountain Brew. 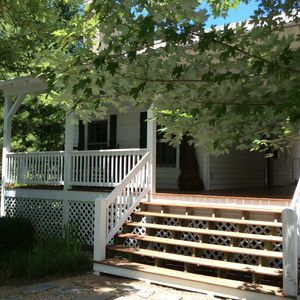 The cabin features a dedicated slope entrance from the lower deck with plenty of gear storage. If hitting the slopes is your goal then strap'em on, step on the slope from the lower deck and go! 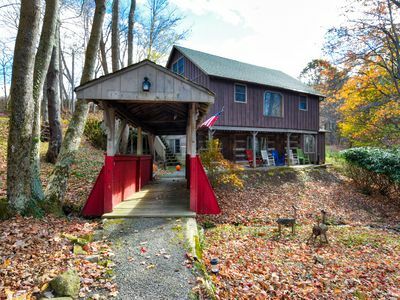 No other cabin boasts the maintained access this one has as the owners maintain a ski up snow feature to the lower deck. Yes, it's that close and that easy! 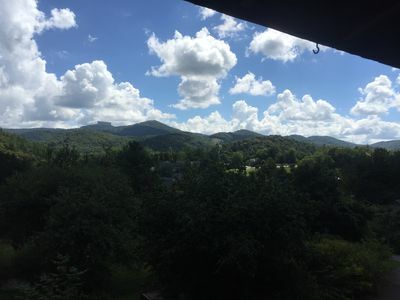 After a great day of exercise you can enjoy lunch and dinner in the resort village Beech Tree, or in town at Brick Oven Pizza, Beech Mountain Grill, White Wolf Lodge, or many others. Then come back have a refreshing hot bath in 1 of 2 tub/showers then watch your favorite team on any of 4 cable televisions while relaxing in 1 of the 3 KING size "ChiroSlumber" mattresses. No money was spared on this level of comfort when it comes to sleeping. Absolutely the best mattresses on the mountain!!! 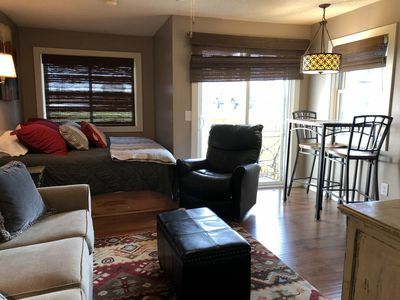 One bedroom features a one-of-a-kind custom king size bunk bed! You'll not get this kind of refreshing sleep after a hard fun day anywhere on Beech!! 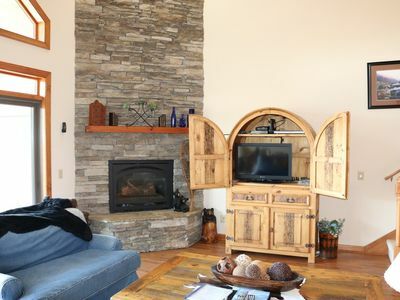 The décor is truly mountain cabin with all the trimmings of warm colors, distressed floors, interior barn siding, and fireplace. 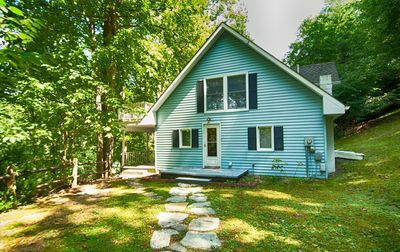 This cabin is one of only a handful for rent slope side that is this nice and comfortable. 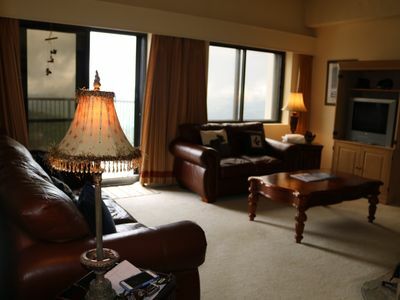 It is one of even less that is mold and mildew free, featuring easy entry from the road offering home front, private, legal 2 car parking. **It's important to remember during the ski season the road to this mile high delight may be treacherous and 4 wheel drive vehicles and chains may be required. With an ideal location on the slope, snowmaking by the resort is highly probable. Even if inclement weather is not forecasted the road could still be snow covered. Contact the owners for regular road updates. 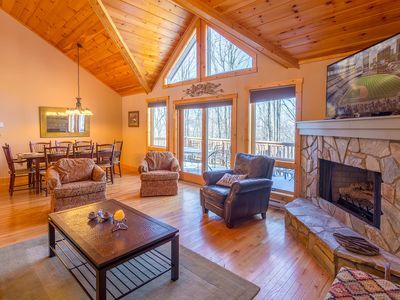 This majestic cabin is ideal for families and perfect for that romantic getaway all year round with privacy and window shades. We're so sorry NO PETS allowed, NO SMOKING, no more than 6 occupants, and 2 car parking maximum allowed. No Exceptions for any of these policies. 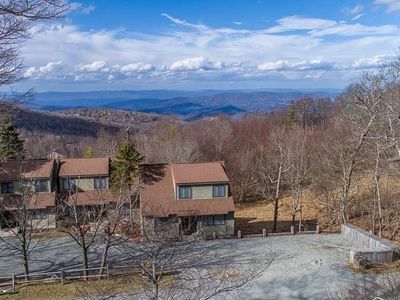 Space, views, mountain charm -- and two updated bathrooms! 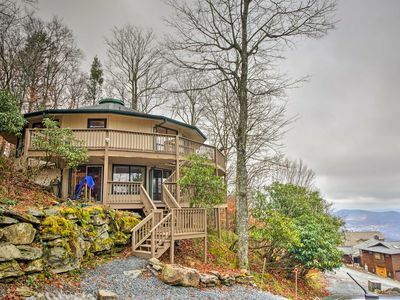 Enjoy a unique, rustic get-away between Banner Elk and Beech Mountain. 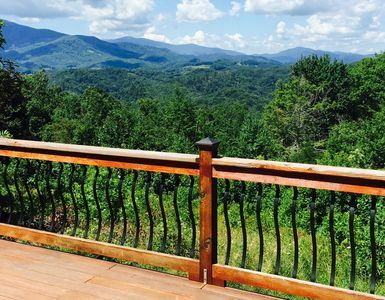 Valle Crucis Farm Cabin Rental offers hiking, fishing, sledding on property. 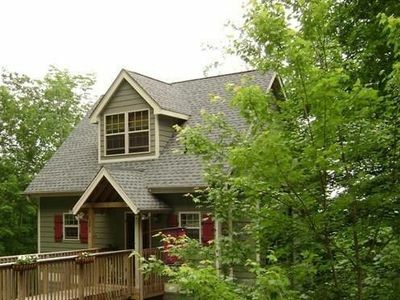 4BR/4BA Beech Mtn Home, Beautiful Open Floor Plan, King Master Suite, Lake Access, Firepit, Nearby Skiing, Pet Friendly!